The birth of our Ascension Greek Orthodox Church goes back to the 1940’s. Churches in Jersey City, Newark and New York served Greek Orthodox Christians of northern Hudson and Bergen counties. However, due to the increase in Greeks moving to the suburbs, dedicated Greek Orthodox Christians determined to practice their faith closer to home rented space on the second floor of a private house in Union City, New Jersey to celebrate the Sunday Divine Liturgy. As the Greek community grew, the need for establishing a church became a necessity. A group of dedicated founders gathered signatures and petitioned the Archbishop Michael in early 1952 for a new church. The application was rejected, but undaunted by this refusal, they enlisted more followers to the cause. The first general assembly was held on May 25, 1952. 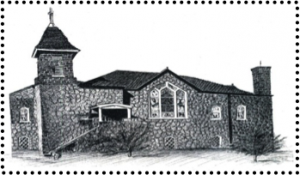 A Presbyterian church was available in Fairview, New Jersey, but lack of funds was still the greatest obstacle. Again with the dedication to the cause, the down payment was secured and the church was purchased in July 1952 for $32,000. 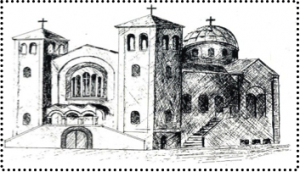 Subsequently, the Archdiocese recognized the group as a Greek Orthodox parish and granted it a charter, thereby founding the “Greek Orthodox Church of North Hudson and East Bergen Counties” in August 1952. At the time the charter was granted, the Reverend Theodore Theodorides was appointed the first official priest of the parish. The official opening of the church was the celebration of the event of the Ascension of Our Lord. Appropriately, the name was changed to the Greek Orthodox Church of the Ascension of Our Lord. Archbishop Michael granted the privilege of naming the church officially to Mr. John Peterson who became the Godfather of the church. Since the first services were held on Thanksgiving Day in 1952, this national holiday has a special significance for the members of our parish. It is considered the “birthday” of our community. The extraordinary spirit of the charter members of the congregation is perhaps best exemplified by the fact that on May 6, 1953, less than seven months after the opening of the church, the mortgage loan was paid in full. The bonds of language, culture and religion that brought these elders together had to be shared with their children and perpetuated from generation to generation. As this faithful community expanded, new facilities were created. A Greek School and a Sunday School were inaugurated. The very existence of these schools increased the interest and participation of many members in other parish affairs. The schools also attracted new members, families with young children, and as the movement to the suburbs accelerated, the Ascension Church in Fairview, New Jersey flourished. The original Greek Afternoon School was conducted on the church premises, but as the parish expanded, new classes were opened in Fort Lee and Bergenfield to accommodate those families living far from Fairview. During this period of the late 1950s and early 1960s, a number of parishioners who lived north of the George Washington Bridge, including a very large majority of the parish council, began a search for land to build a community center away from Fairview. Once the land was found, the parish council purchased seven acres in Tenafly, New Jersey from its Greek owners, the same family of which donated four more adjoining acres. During this period, it was also decided to build a church and a community center at the Tenafly site. Sunday, November 9, 1969 marks the day when St. John the Theologian became a reality. For a few years, the two churches operated as one community with the Ascension Church being the mother church, but the unity did not last very long. A new chapter for the Ascension Church begins in 1973-1974 when both churches were granted their independence from the Archdiocese. With this new beginning, the Ascension Church had $312 in its treasury, but the parishioners never gave up. It began to flourish again thanks to the dedication and hard work of its people. Our first bazaar was held on September 13-15, 1974 at the North Bergen High School. The two adjacent buildings to the church were purchased and converted to our offices, community center and school, all through the generosity and hard work of the Ascension parishioners. Then in late 1979, the parking lot was purchased and within two years, it was paid in full. The Ascension again was a vibrant community. The Greek School had more than 200 students, the Sunday School had more than 150 students, the GOYA had more than 75 youths and the GOYAL had more than 50 young adults. The Philoptochos, the PTO and the Choir by now were much a part of this community with their dedication and participation in every aspect of the church activities. As a result of this continued growth, it became apparent that the existing facilities were not adequate. In February 1986, the general assembly voted to accept the plans for a new church to be built at the same site of the old church at an estimated cost of $2 million. Again, the parishioners of the Ascension Church did not hesitate to be part of this project. On Sunday, June 4, 1989, following the Divine Liturgy celebrated by the late Metropolitan Silas, the ground breaking ceremony took place attended by a number of dignitaries and parishioners. A fateful event occurred during the early morning hours of September 8, 1991 when the old Ascension Church was destroyed by fire. How many faithful had passed through its stone walls with magnificent stained glass windows, each one with a different memory, a christening, going to Sunday School, their wedding or a funeral service of a loved one. All gone forever. One more time, the parishioners of the Ascension Church being tested, but their faith, courage and dedication came through again and again. A temporary church was immediately established in the community center and the call went out for contributions for the new church. What follows was a labor of love and devotion to our Christian faith. November 23, 1997 was the day of fulfillment for the Ascension Greek Orthodox Church. The ceremonies began with the Orthos at 9:30 a.m. followed by the Agiasmos and the formal opening of the new church doors by Archbishop Spyridon. For the parishioners of the Ascension Church, the longing for the Byzantine-domed church in their midst was finally satisfied. The congregation had built the institution of its dreams, a home that expresses in brick, steel, tile and marble the distinctive language, culture and religion of its members. The Ascension Church is an expression of these people’s faith in God and their progress in the larger community of American life. In 2012, we celebrated the 15th Anniversary of the construction of our beautiful new church!! In addition to our beautiful new church, on the right side of the church, a small shrine of the Nativity of the Theotokos was erected dedicated by the Kambousioun Society of Chios. The accomplishment of building the new Ascension Church has not exhausted the vitality of this community. Rather these facilities are the center from which the community’s energies emanate for the good of all people, not only of the congregation, but also of all the people in the entire area. And as the church parish family continues to grow, a decision was made that our facilities were inadequate for the future and youth of our parish. As such, with the dedication of our parishioners, on March 25, 2011, three adjoining properties were purchased for $1,330,000. These buildings will be used to expand our parking facilities and community center. Again, our community has joined together and almost $700,000 has already been raised to pay down this mortgage. Yet another sign of the devotion and dedication our parishioners have with our church. And just as was done in years past, we know our parish family will make our church’s expansion a reality in the near future. To our church founders and all those who over the years labored and volunteered their time so our children and grandchildren can have a magnificent place of worship and the perpetuation of the Hellenic heritage, we say, thank you—long live the Ascension Greek Orthodox Church, the home of our Greek Orthodox faith and Greek culture.